This post belongs on the blog for two reasons. 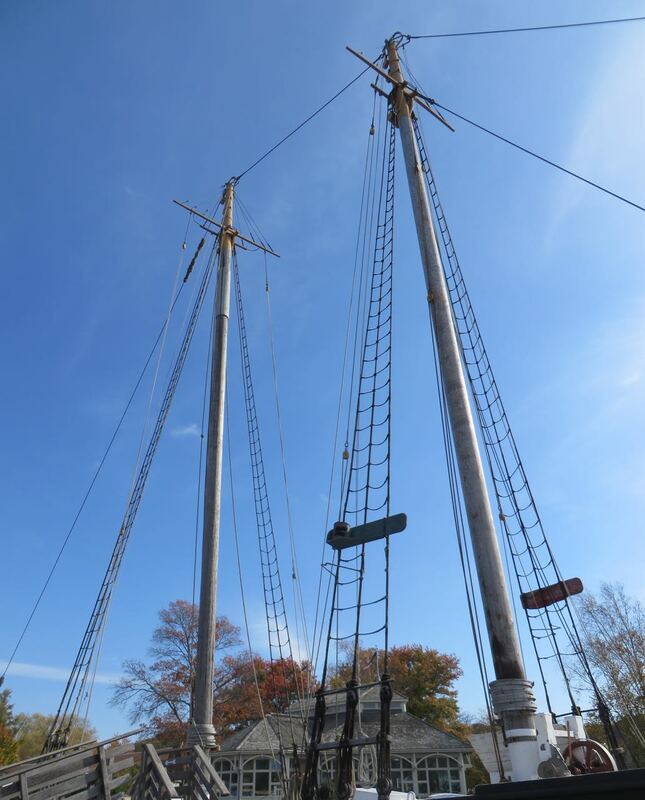 First, Mystic Seaport is about sailing and boating, obviously. 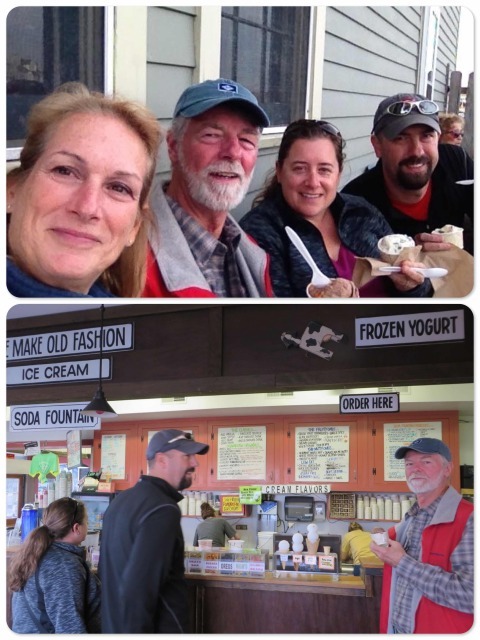 Second, we enjoyed a visit with Tim, Al’s son, and his wife, Amanda, who have been traveling the western and southwestern United States for over 2 years in a 25-foot Airstream RV. We enjoyed our day with them very much and found ourselves discussing the similarities and differences between the two life style modes, RVs on land and boating at sea. Is this another case of “like father, like son”??? Tim and Amanda have a wonderful blog, WatsonsWander, that documents their adventures. 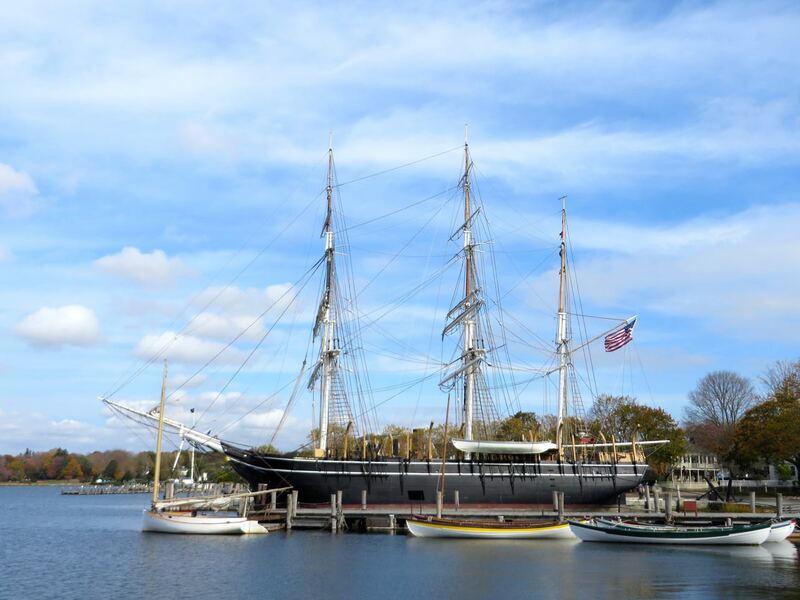 We decided to spend the day at Mystic Seaport, the “Museum of America and the Sea.” Here it is right in our own “backyard” and we rarely (maybe never?) spend any time there. We are also folks who prefer outdoor museums to indoor ones. Mystic Seaport offers hands-on activities, special events, and is a valuable education and research center, as well as a world-renowned maritime museum. There are historical boats, exhibit halls and a recreation of a New England seaport town. “A quintessential New England experience, Mystic Seaport is a link to our seafaring past and endless, year-round opportunities to immerse themselves in new worlds of hands-on history.” We chose to join and become members of the Seaport for a year so that we could visit over the coming months and see more. Views of the seaport and from the seaport. The little old tug greets you before you even cross the street to enter the museum. 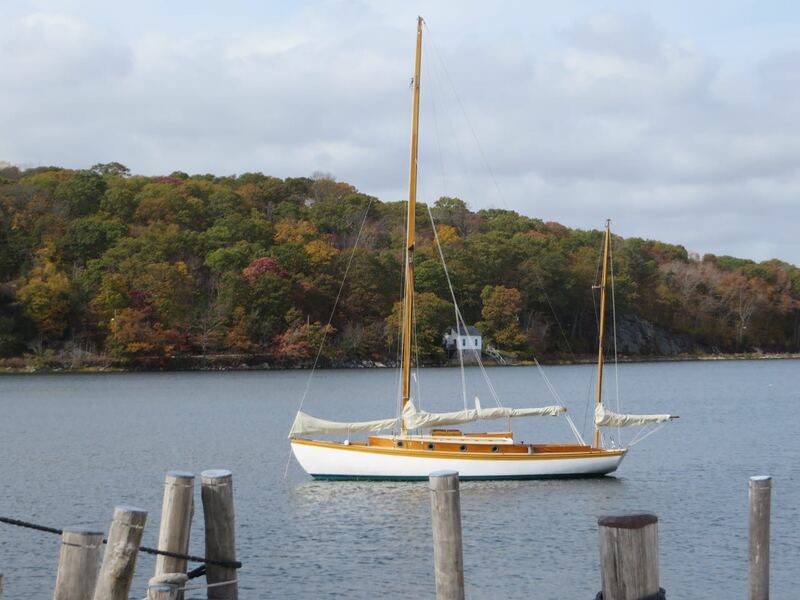 The L.A. Dunton, probably the last large engine-less fishing schooner, was built in 1921 and fished the Grand Banks off Newfoundland and Georges Bank outside of Cape Cod for 30 years. 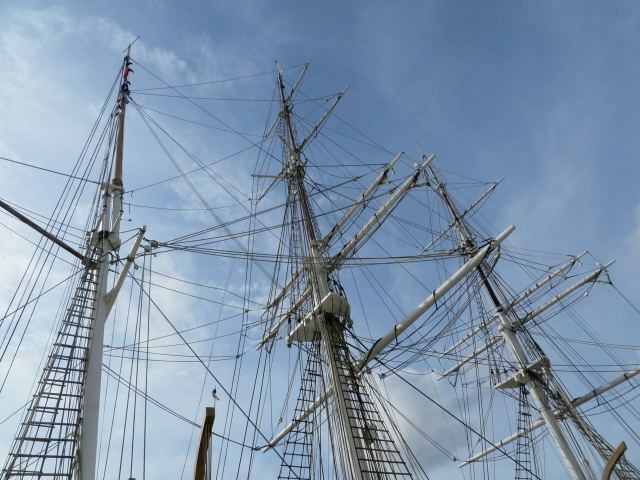 The masts of the fishing schooner, L.A. Dunton. 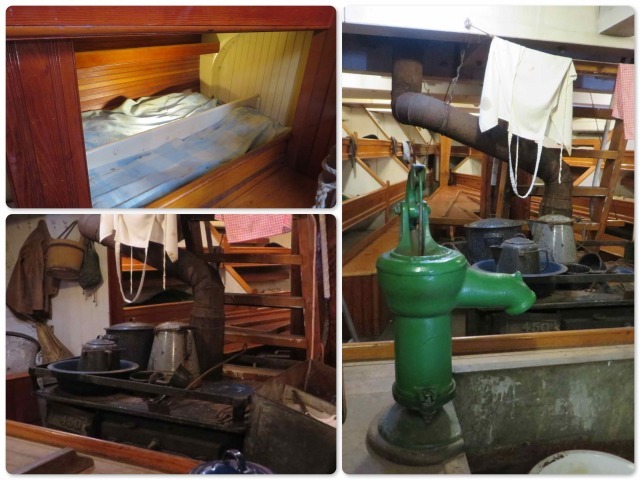 A look around below decks on the Dunton helps one really appreciate today’s boat interiors! The galley and guest cabin on Kindred Spirit are far better than this even before our renovations are completed! 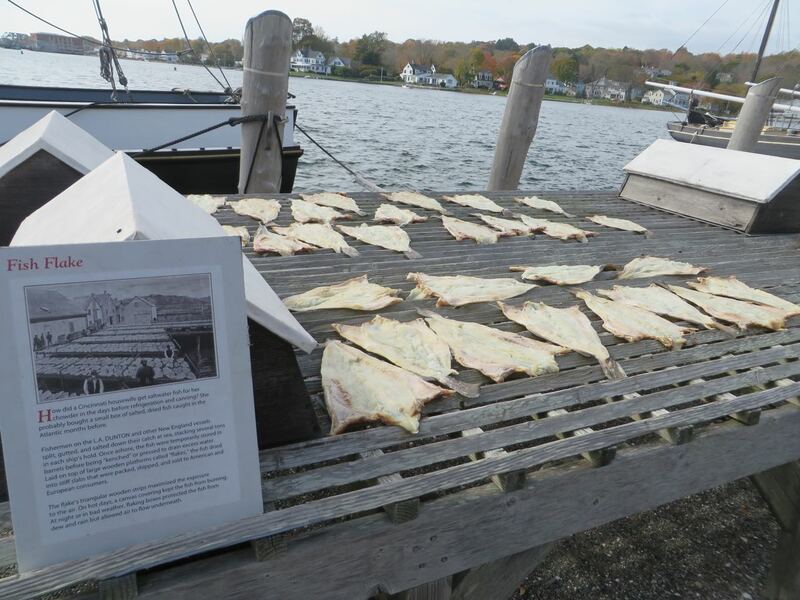 On the dock by the Dunton was a “fish flake” exhibit, and not just for show — the smell was real! 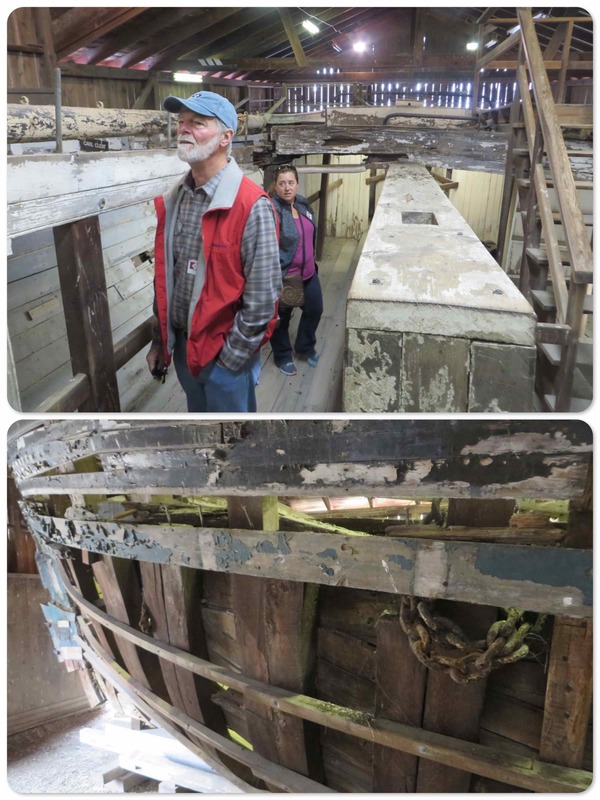 These large wooden platforms, called “fish flakes” are where the fisherman laid the catch to dry, following the salting and pressing to drain the excess water (kenching) onboard during the voyage. The “fish flake”, where the salted and pressed fish are laid to dry — stinky! 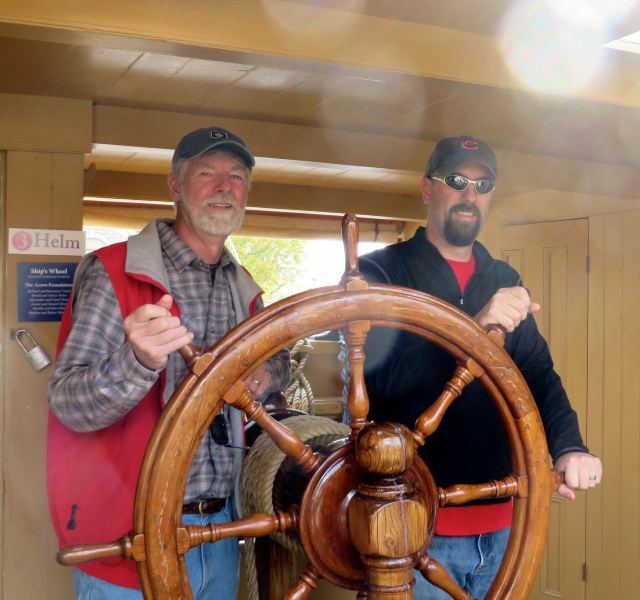 We climbed around in the Australia, a shallow-draft schooner built in 1862. The Australia was donated to Mystic Seaport in 1951 for use as a sail education vessel and was used as a dormitory in the Museum’s sail training program for 10 years. In 1961 she was hauled out for restoration, but the decay was too extensive to make rebuilding worthwhile. The Museum decided to preserve Australia as an exhibit of ship construction so that people can examine her “bones.” Just in case you are wondering, the Australia is not a floating vessel. She is beached and housed under a roof. This very very long green building is where rope for the ships was constructed. 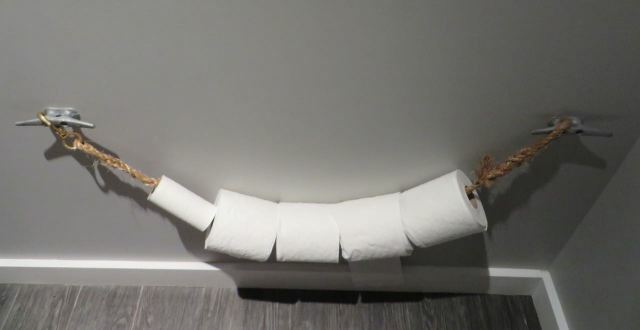 No easy task! 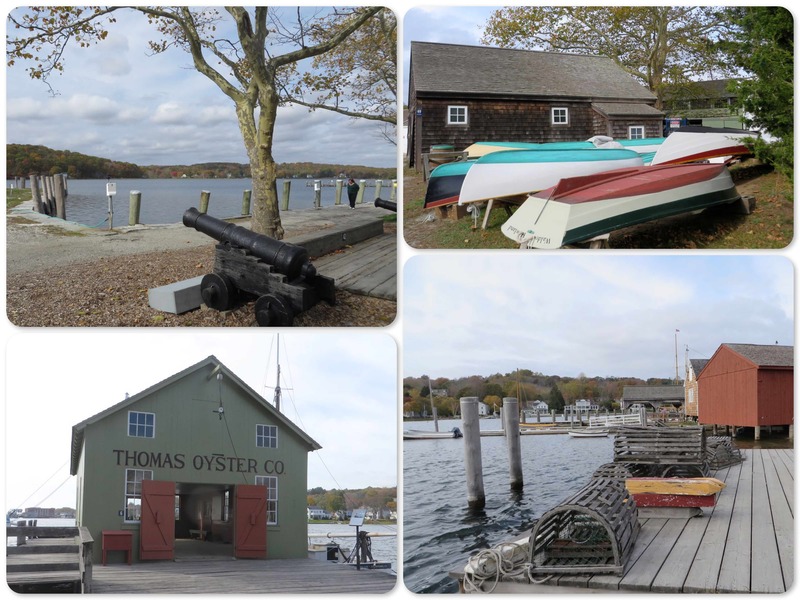 Strolling around the seaport – views of the river, colorful dinghy bottoms, an oystering exhibit and old-time lobster cages. The most famous ship in the Seaport is the Charles W. Morgan, the last of an American whaling fleet that numbered more than 2,700 vessels. 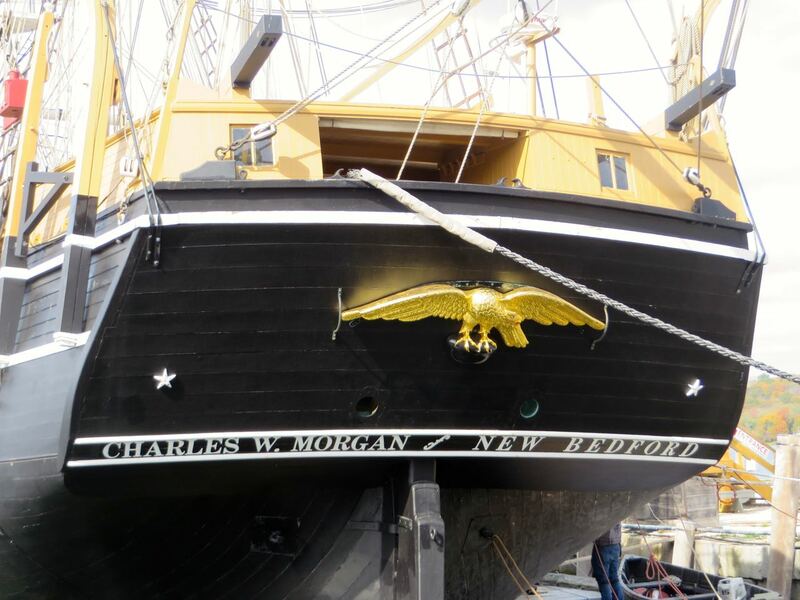 The Charles W. Morgan, built and launched in 1841, the Morgan is now America’s oldest commercial ship still afloat – only the USS Constitution is older. 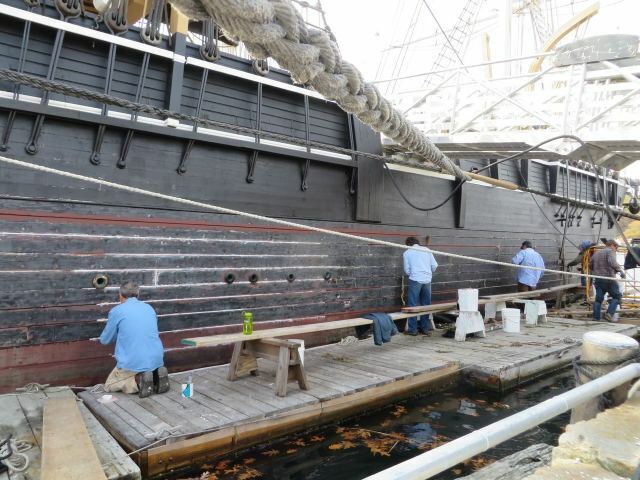 The work of restoration never ends on an old vessel. Now that ‘s a lot of line. 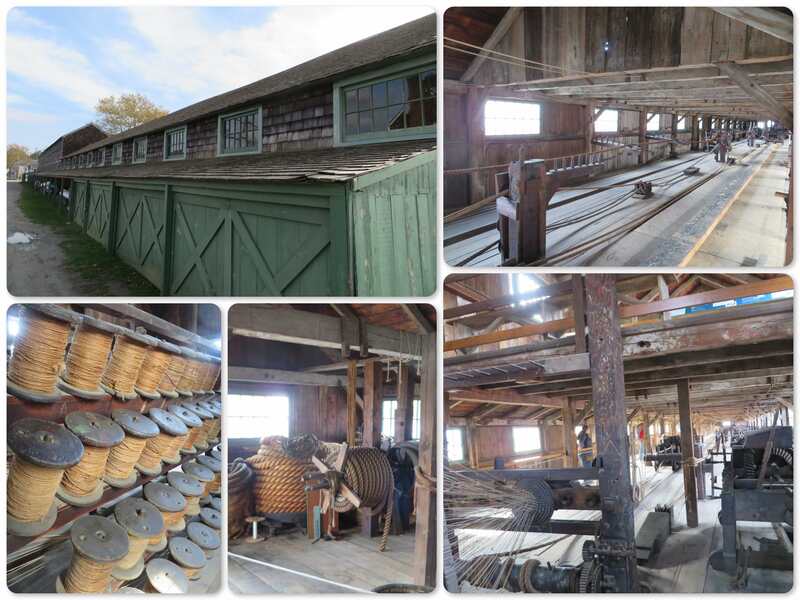 No wonder a shipyard needed an entire building for making rope. 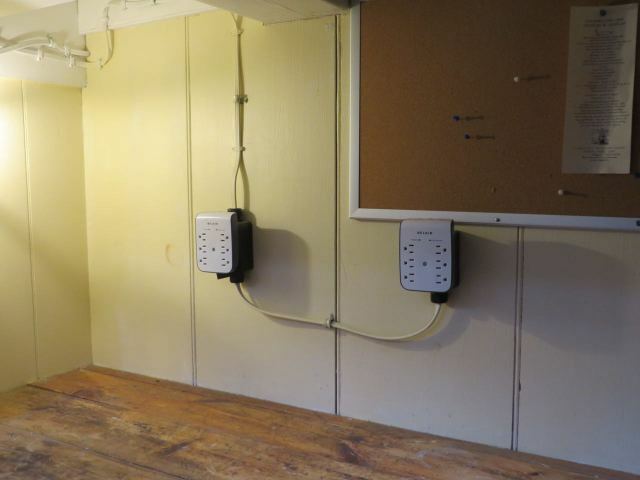 The bunks on the Morgan look like a tight squeeze. 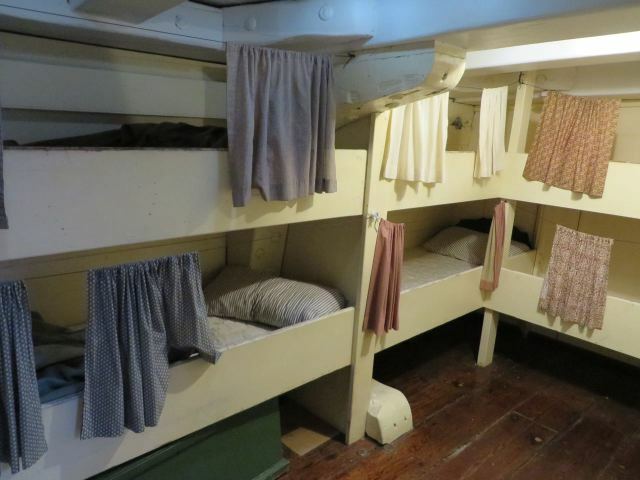 There were 24 bunks just in the this section of the bow, and they were used on the 38th voyage this summer in 2014! It was amusing to notice a little bit of modern convenience on this historic ship. The Charles W. Morgan only had one original deck prism remaining. 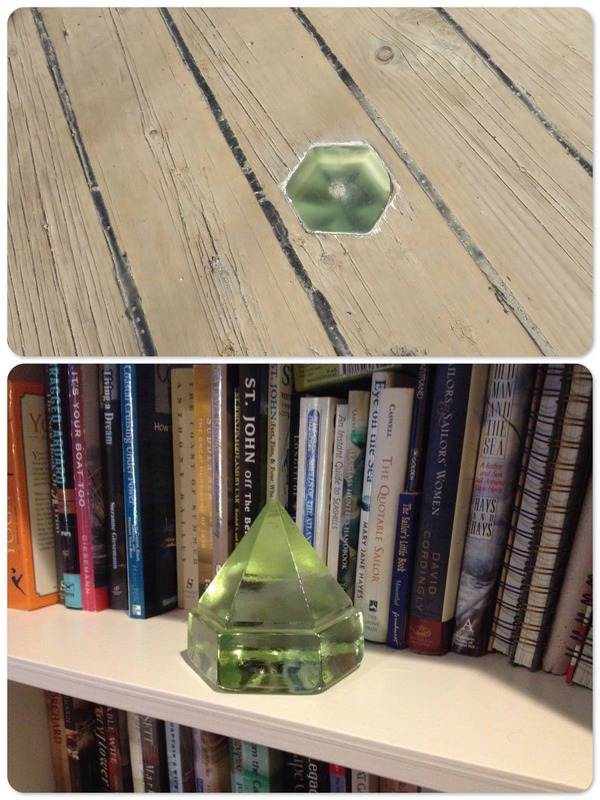 A deck prism (or deck light) is a prismatic glass set into a ship’s deck, to let natural light below. The prism hangs below the ceiling and redirects the light sideways; the top is flat and installed flush with the deck, becoming part of the deck. The bottom photo is my reproduction deck prism that I have owned for years. I did not know until this visit that my deck prism is a reproduction of the one on the Morgan. Evidently, that last remaining original one is a very famous deck light. 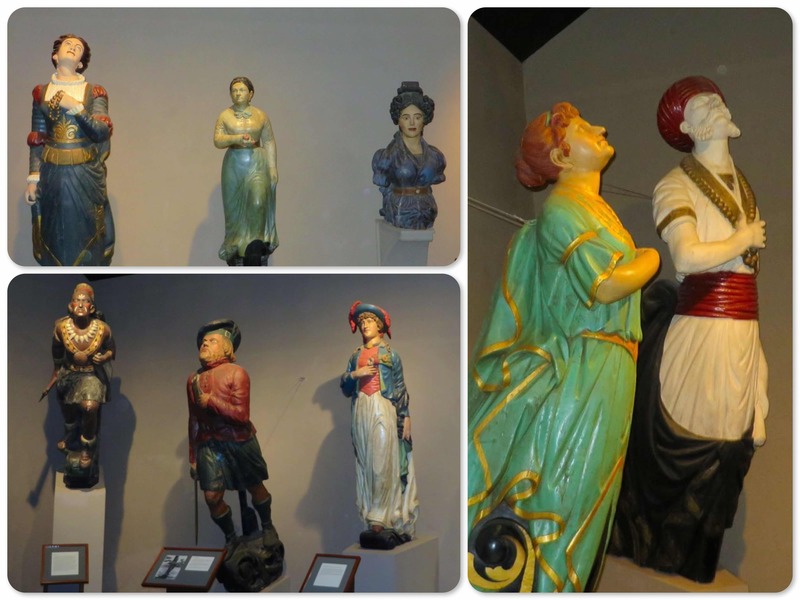 An interior exhibit of figureheads from old ships. 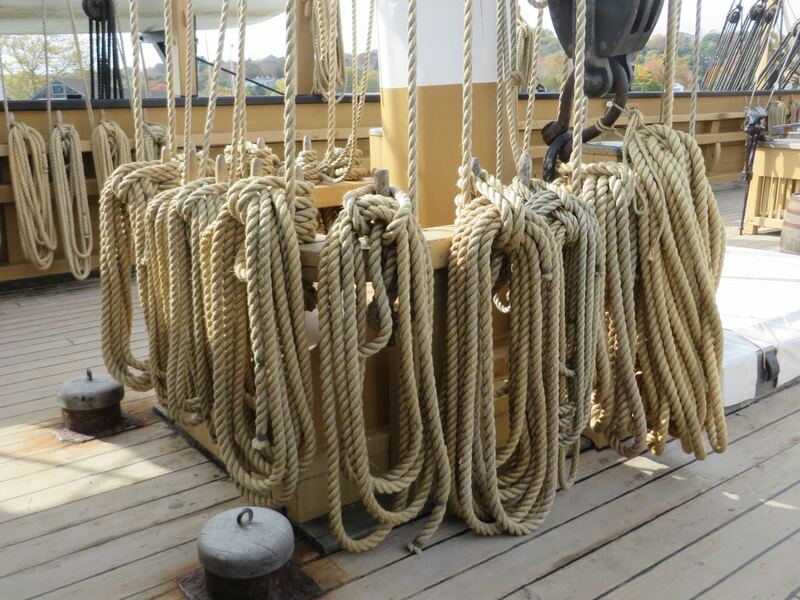 They really are works of art and must take some abuse hanging out there onto bowsprit of an ocean going vessel! I had to take a photo of the old one room school house – how can a retired educator resist that? 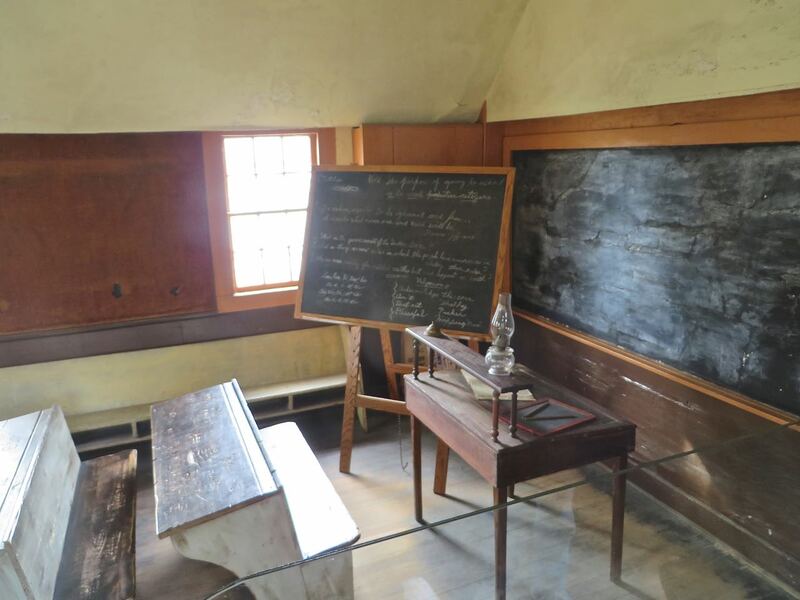 We have an antique school bench just like this in our basement. 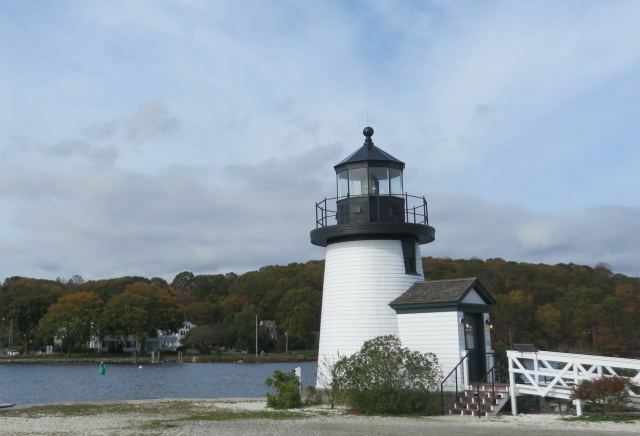 This little lighthouse looked so familiar – turns out it is a replica of the Brant Point Lighthouse on Nantucket. We have visited that one many times. A charming little sailboat anchored in the river. Visiting boats can dock right at the seaport, for a hefty fee. 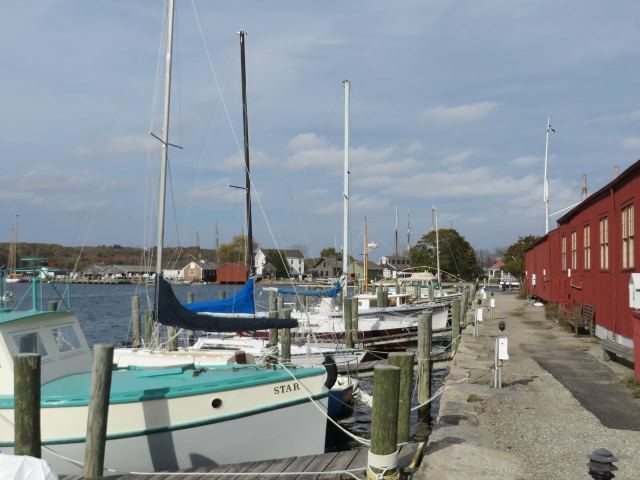 With a more expensive membership level, the “discounted” dockage rate is $3.25 per foot! 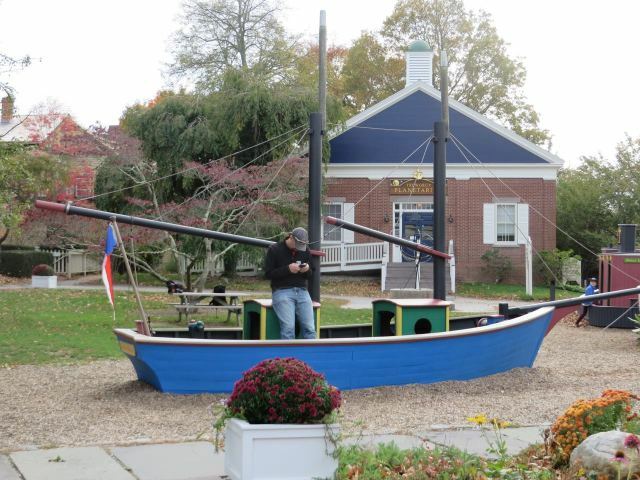 Mystic Seaport has many exhibits and activities for children, including a small playground. Tim takes a moment to text while standing in the model sailboat. 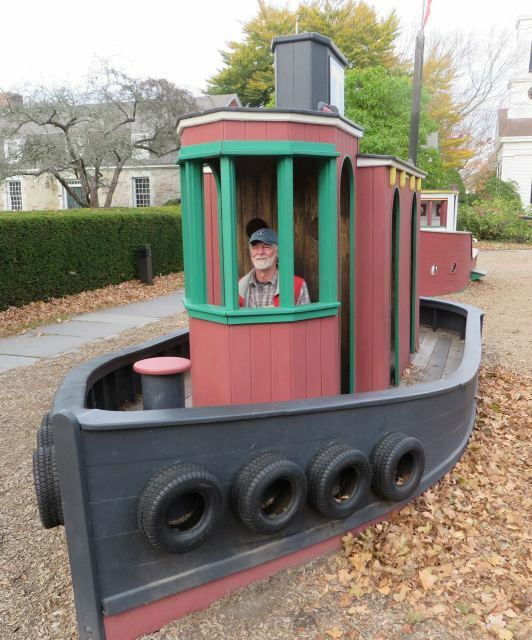 Al captains the playground’s tug boat. I think we better bring the grandchildren here. 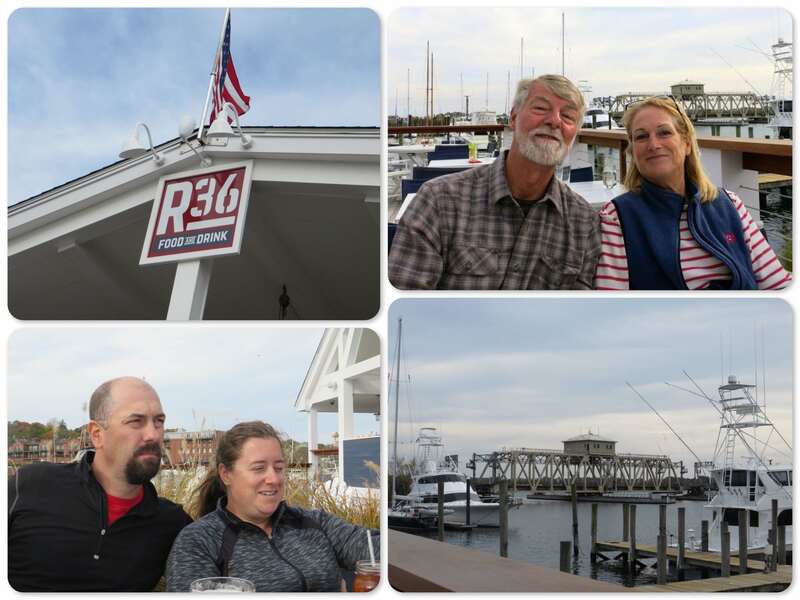 We decided to have lunch in Mystic and tried a new waterfront restaurant, “Red 36” which has been open for only four months. Although it was late October, we chose to sit outdoors and soak up the atmosphere. We would have enjoyed a little more sun to soak up, too! The location was great and the food was good, but the portions were small for the prices. Enjoying lunch at Red 36 with a view of the Mystic River and the railroad swing bridge. As for the restaurant’s name, red channel markers 32 and 38 mark the river to the north and south of the restaurant, but there are none in front of the restaurant. The owners chose “Red 36.” I suppose they could have named the restaurant Red 34 also, but not 33, 35, or 37 — Red buoys (“nuns”) are even numbered, green buoys (“cans”) are odd numbered. The town of Mystic is a great place to visit as well. Especially for a stop at Mystic Drawbridge Ice Cream Shop! 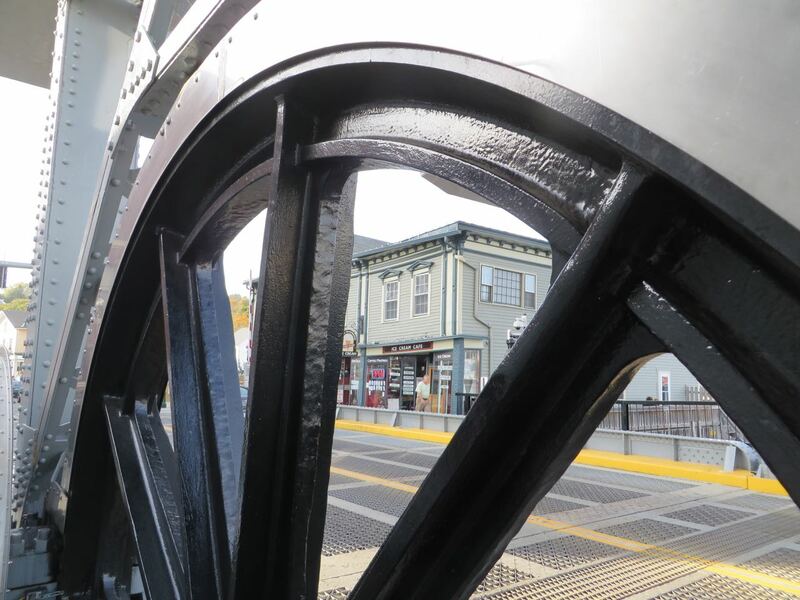 Taking a peak through the wheel as we walk over the drawbridge. The drawbridge is up for a boat to pass though. 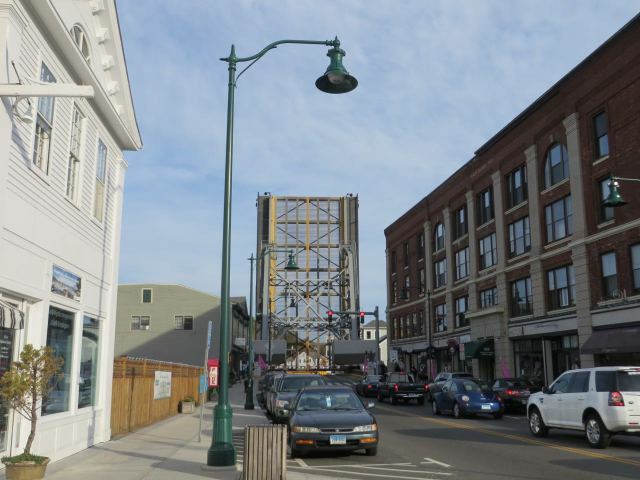 The Mystic Drawbridge is a bascule bridge, a type of drawbridge with counterweights. They are huge! 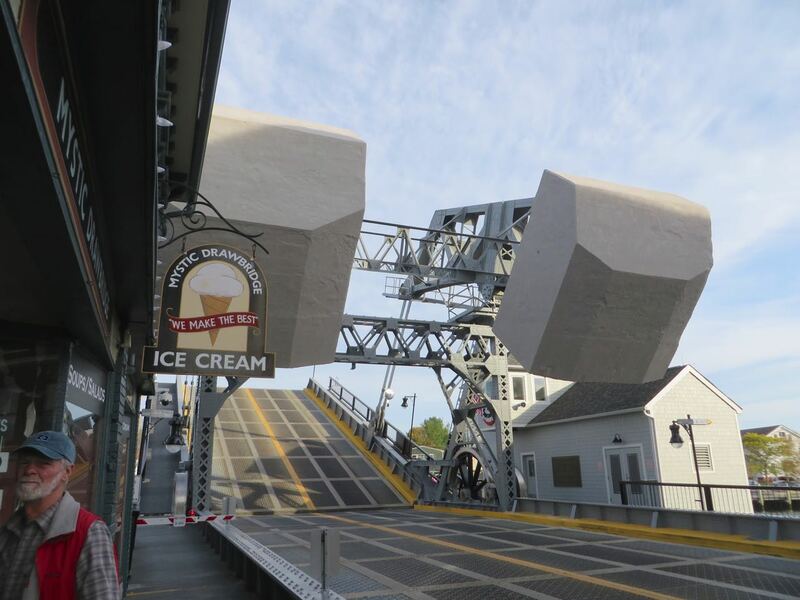 Mystic Drawbridge Ice Cream has my favorite flavor – Lemon Chocolate Kiss!! It was a fun day! 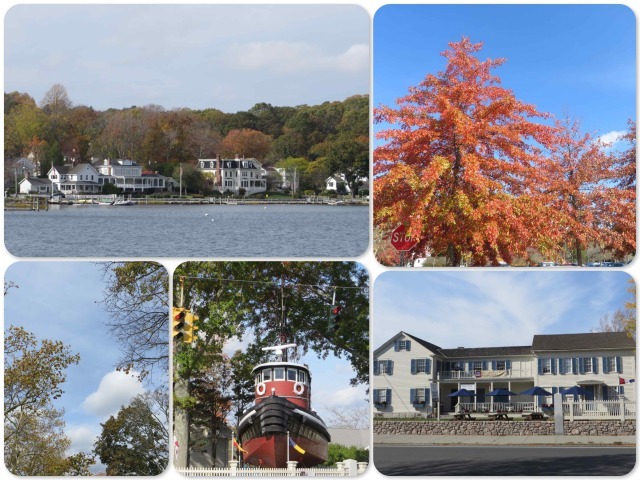 We look forward to visiting Mystic Seaport again, and we sure look forward to seeing Tim and Amanda again when they visit Connecticut next summer with their Airstream.